This winter and spring has been exceptionally wet (I could also say and miserable). 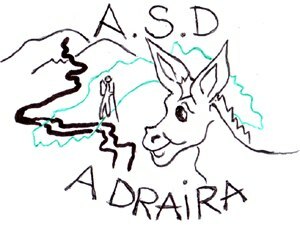 It has held up our work on the land and kept us cooped up indoors far too much so the opportunity for another wak with the Apricalese from ASD A Draira was too good to pass up. It was a very last-minute affair as the weather had been so wet no-one knew if we'd be able to do the walk. The guys from A Draira had been busy clearing the mule track in preparation for our walk. May Day dawned slightly cloudy and damp-looking but the forecast was not for rain, despite the downpour the night before. 9.30am was rendezvous time in the piazza in Apricale. A bit early for a bank holiday but we made it - even Ruby who was walking with us both this time. 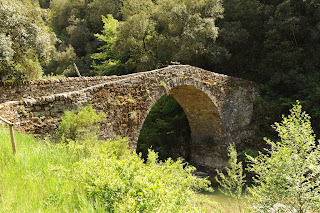 The plan was to walk down to the Romanesque bridge and then up the other hill a little way to the point where the mule track split off to Perinaldo. Here we would take the path for the little chapel of Moudena and the big clearing with its table and benches with a big BBQ. During the walk we would learn about the wild plants and herbs that grew in the areas and eat some for lunch. I was really keen on this as I love the idea of foraging for food. It would give us ideas for food at our future agriturismo too. The ground was pretty wet and this time we had brought lots of water and dressed for warmer weather. Ruby had a hat, change of clothes and something to lay on if she needed a nap and we knew we'd probably have to carry her some of the way. We set off downhill. Opposite the pharmacy we started on the wide, cobbled mule track down to the Romanesque bridge. We stopped several times while this or that plant was explained to us. Sadly I hadn't bargained on a grumpy daughter who wouldn't let me use my camera as she wanted to press the butttons or be picked up. This didn't bode well as we had only just started on our way! I managed a few pictures but couldn't take any notes so I now know you can eat these things but not which bit or how to prepare them. I'll have to find someone to fill in the gaps when I get a chance. That will make a separate blog post. The mule tracks are an incedible feat of work as they are wide and clearly well-made although many have fallen into disrepair. These would have been the only routes from one place to another years ago - with everything carried by mule or donkey. 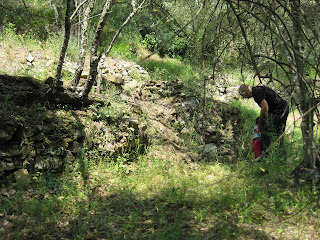 Ruby eventually settled down and we past a beautiful ruined olive mill next to the river. Then we climbed onto the humped back of the bridge and peered down the river. It was surprisingly fast moving but still looked inviting as at various points the water runs through little rock pools. Could be wonderful in summer when the river is not so swollen with the Winter & Springtime rains. Over the bridge we all went and here we started to climb. It was not too onerous for us but quite wet and muddy in several places. The cobbled steps were also quite high for little legs so up on Daddy's shoulders went our little Ruby. It is a beautiful wood and looks as if it was managed at one time as it is still very clear between the trees. Up we went a little further until we reached the crossroads we had been seeking. One way to Perinaldo and on to Moudena. By now, any prentence of investigating wild plants has been abandoned. Stomachs were rumbling and Ruby was tiring. We were keen to reach our destination and the promise of lunch. We strided ahead (Ruby still on Daddy's shoulders) until the forest cleared and we passed little fenced areas growing vegetables and fruit. There were a couple of 20th century houses behind the plots. By this time Ruby had decided she had had enough but she had walked an incrediby long way for a 2 1/2 year-old with very little complaint. Luckily the great thing about living in Italy is there is always a 'Nonna' (Grandmother) to adopt and the lady in front of us took her by the hand and they walked together the rest of the way, stopping occasionally while the lovely lady pointed something out to Ruby. They even found a beautiful crystal with little pieces of wood inside which Ruby has in her box of treasures. When we arrived at the chapel, which looks as if it was built in the 40's or 50's there was the lovely smell of charcoal burning and sound of children laughing and dogs barking. The rest of the children had arrived in the car with Petra and the others from Apricale. A group of men were tending the BBQ and there was a very long concrete table with concrete benches laid out with paper tablecloths, water, bread & wine. The table has a metal structure above it, perfect to cover in bamboo for some shade. What a great place for a BBQ. I was imagining it at night with candles and music and the metal frame covered in clematis or some other fragrant climber - another mental image filed away for our own place. 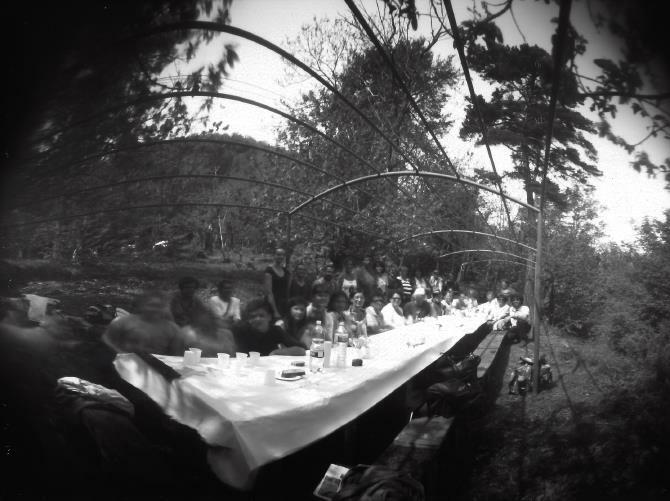 Noris took a wonderful picture of us all with a pinhole camera. We ate a salad of the wild plants gathered during our walk, torta verde, frittata and melanzane (aubergines) 'sotto olio' which were truly delicious. All washed down by organic red wine. Then came some fantastic sausages from the BBQ. We all ate very well. There was even coffee and liquers! Paul snuck off at some point to go and get our car. There was no way Ruby would walk back so he did the same walk back to Apricale to collect our new 4x4 Panda and drive it for the first time offroad to get to the chapel to pick us up. He came back with a huge smile on his face. He had thoroughly enjoyed himself and he has no interest in cars whatsoever. He loves this little car though! Another wonderful day in Apricale. The medieval town of Apricale (607 inhabitants / 291 m above sea level) is inland from Bordighera and Ventimiglia, at 13 Km from the coast. Its fortunate position is the origin of its name, which derives from apricus, open to the sun, but the main characteristic of the town, which has always enchanted its visitors, is the picturesque aspect of the nucleus, a sinuous cascade of stone houses, spread along the spine of a steep slope dominated by the rise of the castle. This extraordinary sight, unique even in the rich examples of ‘Villages of stone’ in the Ligurian ‘intemelia’ (i.e. inhabited, prior to the ancient Romans, by the Intemelii tribes), and celebrated by poets and writers and painted by famous artists, who have contributed to make Apricale a town particularly frequented and loved by artists. 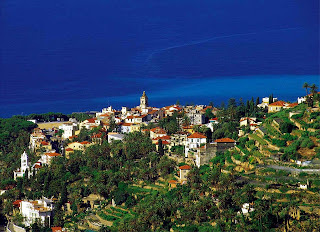 The town preserves, intact, its medieaval structures and atmosphere with its original old town, high on the hill where you also find the Castle and the village church. The houses run outwards in concentric circles and the two quartieri or neighbourhoods, which from the harmonious central piazza reach out in opposite directions of the hill, are called respectively abrìgu e ubàgu, that is to the south and to the north. A maze of tiny streets, the narrow alleys that surround the pinnacle and are fragmented into multiple levels, connected by steep stairways and covered passages, form a street map unchanged for a millennium and overlooked by tall stone houses often joined together by arches. It is the world of yesterday, impenetrable and reserved, today finally open to tourists where you will find lodgings, restaurants and artists workshops, brought back to life to the great joy of the visitors. All around, the embrace of a countryside that from the fasce, the terraces supported by dry-stone walls, which over the centuries have snatched from the mountains handkerchiefs of land to cultivate send the silver reflections of the olive groves and the dark green of the other vegetation up as far as the denser masses of chestnut and pine forests on the higher mountains. Its origins are lost in prehistory as evidenced by the burial mounds from the Bronze Age found in the area Cian deu Re (Pian del Re). The village was founded around the tenth century by the Counts of Ventimiglia and passed to the Doria of family Dolceacqua around 1276, when it was already governed by the Statutes reformed in 1267 (the oldest in the Liguria) and its form of government was typical of a free Commune. Then Apricale followed the fortunes of the lordship and marquisate of the Savoyard Doria, suffering the destruction of the castle in 1523 by the Grimaldi of Monaco, participating in various wars and suffering, in 1794, the French occupation. The current appearance and size of the town is the same as at the end of the sixteenth century, with the core older by two or three hundred years. The village has a medieval urban layout of enormous interest, both for its excellent preservation and for its mixed structure. It is formed by the central part enveloping or encircling the castle, arranged in a semi-circle and surrounded by the planted circle of the old Carugio Cian (flat alley) and from the two clusters of peaks located on opposite sides of the ridge. These can be followed westward from Via Castello and Via degli Angeli, with its perfectly preserved medieval gate Cousutàn (from the bottom) and eastward from Via Cavour. Two other medieval gates that mark the ancient circle of fortified walls, are respectively porta Cutrùn, located at the foot of the supporting wall of the castle - at the beginning of the northern stretch of Via Martiri and the other, still in Via Matiri but on the opposite side, the so-called porta deu Carugiu Cian, complete with its stone hinges. This bears the inscription on the left of the upright stones "1764 fame ubique" (hunger everywhere), reminiscent of a dramatic period of famine. The focal point of the town is the large square. The steepness of the slopes has forced the construction of precipitous and narrow stairs, sometimes replaced by stepped ramps, to connect the alleys that wind in concentric circles. This along with, often covered, walkways that connect the facades of the houses, the frequent squares and panoramic views on the sunny valleys that surround Apricale make a visit a pleasant walk through history and countryside. The visitor will be particularly struck by the medieval charm of the village, the stone houses overlooking the alleys with their irregular routes, from steep stairways and dark transverse glimpses of the many flowers and plants that adorn the exterior stairs of the entrances to the houses. This is a place where you can immerse yourself is a timeless world, ancient and unchanged over the centuries, which almost unbelievably is being offered to satisfy our curiosity but also demands our respect. The main economic resources for Apricale (607 inhabitants), are agriculture and tourism. We produce an excellent extra virgin olive oil, the town is in fact part of the Associazione nazionale "Città dell'Olio" (National Association of Oil Towns) and is located along the “Strada dell’Olio” ("Road of Oil") in the land of the Taggiasca olive. Apricale in recent decades has become an artistic center of prime importance, which maintains fruitful contacts with the neighboring Côte d'Azur and the world of art and culture. The prestigious temporary exhibitions in the renovated Castello della Lucertola (Castle of the Lizard), which also houses a rich museum, and outdoor summer night performances of the Teatro della Tosse with sets by Lele Luzzati are just some of the reasons for the attraction, supplemented by the ancient cultural and artistic heritage, which includes frescoed churches and fine paintings. There are numerous works of contemporary painting and sculpture that adorn the rooms of the castle and the corners of the village, along with fifty murals distributed on the facades of the houses. Equally interesting are the many churches, among which surely Santa Maria degli Angeli at the foot of the village stands out, with interesting frescoes dating back to 1400. There are also L'Oratorio di San Bartolomeo, with an altarpiece of wood from 1544 and the cemetery church dedicated to Sant’Antonio Abate built on the ruins of a Roman temple. Of course there is the Parish Church dedicated to the Purification towering over the magnificent square, which is located in the town centre, the point of departure or arrival from or to this infinite maze of alleys. 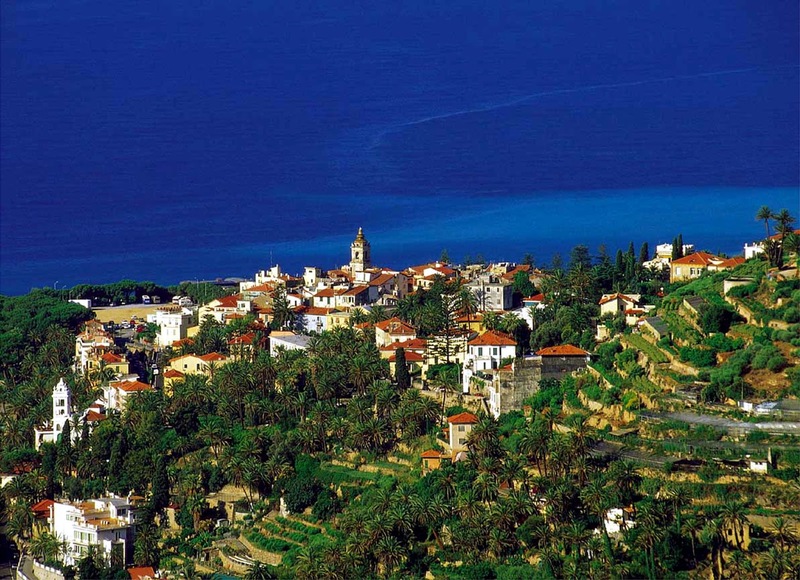 "Borghi più belli d'Italia", by ANCI, first Ligurian town honoured with this award. "Bandiera Arancione" by the Regione Liguria for inland towns, in collaboration with the Touring Club Italiano. "ISO14001 per l'Ambiente", "ISO9001 per i Servizi", certifications recognised at an international level Apricale has also achieved the certificate "OHSAS18001 di sicurezza" which bestowed on Apricale – the first town in Italy – the attainment "dell'Eccellenza" (of excellence). Well, last week we finally got to sit down with our geometra to discuss our planning permission. I feel I can finally call him 'our' geometra as we have agreed a price and have now engaged him to do the work. It seems the mayor is very happy to have us invest in the area as he (quite rightly) says that an agriturismo will bring business to the businesses in the whole village and not just ours. That is a refreshing attitude we have not encountered in our other business ventures in Italy. So long as we keep the properties restored in a traditional manner (i.e. no glass cubes and stainless steel) then he is happy and will fight our case on any planning committees. That is great news for us and will make life a lot easier. 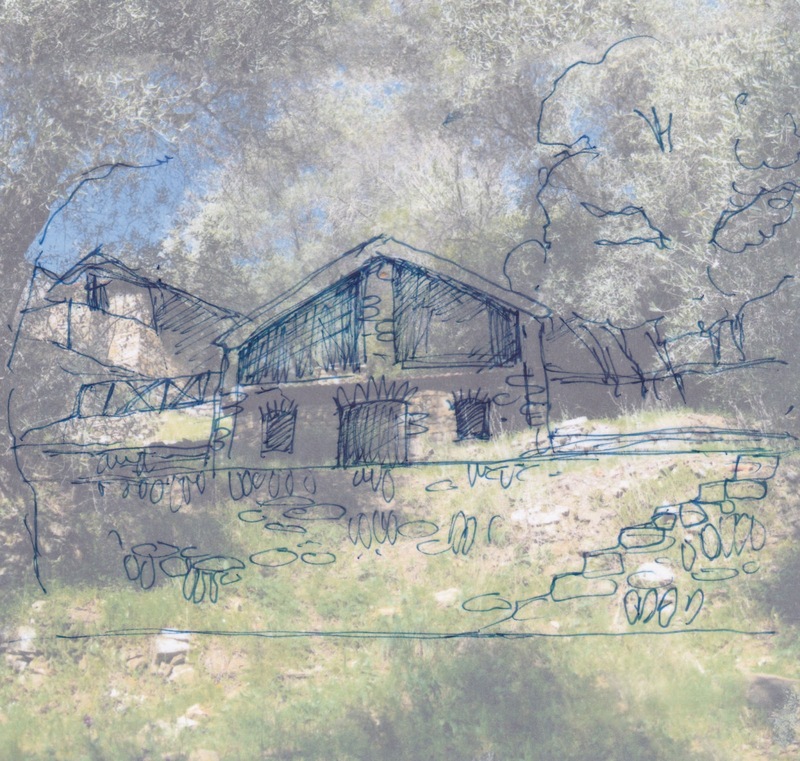 The new planning process for opening an agriturismo means that instead of submitting our renovation permission applications one building at a time, we have to do one great big request. This has a knock on effect. It means Mauro the geometra has to survey every terrace, every building and show every tree on the plans. That's a BIG job! It also means if the planners object to anything, the whole project is held up while we resolve it. On the whole though, its good news. Well, not exactly a stroll. The other Sunday I met up with friends and neighbours in Apricale for a walk along the old mule tracks to the Agriturismo 'Terre del Mistero' for a buffet lunch. The weather lately has been wet and dull and not particularly warm. In fact this walk was postponed from two weeks previously due to the torrential rain. Even this Sunday seemed destined to be wet but we all turned up anyway - hopeful. We started off uphill (in this area it is always uphill, or at least when it is downhill you know the next uphill will be coming soon) through the cobbled alleyways to the top of the town. Up past abandoned houses we walked which, when you looked closely, were not abandoned at all but only inhabited in certain rooms. 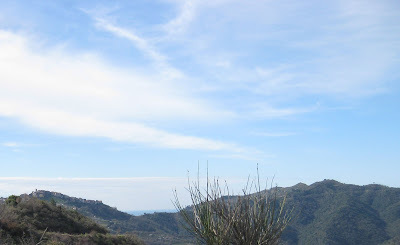 Eventually we came to a road (la strada panoramica - the panoramic road) where we paused to catch our breath. These hills are not for the weak-hearted! From here you can see the hills behind Bordighera and Sanremo and down into the valley where the Mandancio Creek (Torrente Mandancio - also written Merdanzo) runs through the valley floor. It runs below where Apricale sits and on to Isolabona to join the Nervia river which flows though Dolceacqua and out to the Mediterranean. After catching our breath we started off again, off-road, up a mule-track leading up the hill behind Apricale which the guys from 'A Draira' (the Apricalese association that organises social events) had recently cleared and restored. Looking back, we saw the beautiful hills in a wide panorama before us. We continued a little further and came to Stefano's donkeys Bambi and Badoglio. He has recently rehomed these from the donkey sanctuary in Imperia. One is a pregnant female and the other a male. They were not originally a couple but seem to have fallen in love and are now inseperable. They cry for each other if seperated. They are absolutely adorable. I must take Ruby to see them soon. Up and up we went along the mule tracks, pausing every now and again to rest and drink some water. Far from raining it turned into a glorious day. Over 20 degrees and wonderfully sunny.I had brought a little 0.5litre bottle of water - would it be enough? We could see right down the valley towards our farm. We even had some four-legged company in the form of Dobbin the labrador. That's not his owner - just his adopted friend, Mike. We started to walk through some woodland. It was pleasant to be cool as it was warming up, as were we. Eventually we came out on the crest of the hill. We could see the mountains in the distance, still with their snowy caps. We had climbed up from the right of the photo above and when I looked to the left-hand side I was amazed to see the sea, just to the right of the hilltop town of Perinaldo! Not only that but we seemd to have circled behind Apricale and had a wonderful view of it from the other (West) side of the town. Apricale - the Machu Picchu of Liguria! As is always the way here, when you go up you must come down so off we went through the woods. Down, and down we meandered, crossing little streams as we went. I was very happy it was no wetter as the leaves were quite slippery in places and I'm not exactly a mountain goat. I wish I'd brought a stick! Finally we came to a big clearing in the bottom of the valley. Not only was there a big clearing but a BBQ and a big table obviously setup for picnics. A mountain biker whizzed down the mule track and asked our guides how to get onto the main road. I think he had a bit of climbing to do. Some more folks joined us including dogs and children. There was a rumour there was apetisers and wine but it proved to be wrong - thankfully. I say thankfully because we were right in the valley bottom and this obviously meant we had to walk up again. First we crossed the little stone, humped-back bridge over the Foa stream. Very inviting that water looked too! Then off we went climbing up again. I was now almost out of water and my legs were feeling very tired. Up, and up we went past a small hamlet of inhabited and abandoned houses called Foa. From here there were more lovely views of the valley right to the sea. The heat was definitely having an effect and I felt quite light-headed. I was forcing my legs to move now. I didn't think I was this unfit.. Finally we were on the home stretch and I could see Paul & Ruby waiting for me. We sat down at the outdoor tables at the agriturismo and I drank a lot of water (and some wine it must be said) and felt a LOT better. Must have been dehydration because after a great buffet lunch I felt great. Even the next day - no aches and pains. That was a reliefe as I was worried I had turned into an old woman!! When I first saw our farm I was 5 months pregnant and quite huge already. I gamely managed to walk up the big hill on quite a warm April day and clamber over the terraces a little but one thing I couldn't do was to walk the borders of the land. Neither did Paul that day so we only had a rough idea of what we were buying. Later, when we'd actually bought it, while I watched Ruby Paul was taken around by Luciana (the eldest member of the Romagnone family, at 76, who owned the property). We nicknamed her the mountain goat as despite her elderly and frail appearance lept about the terraces like a little goat - much faster than either of us - but then I suppose she'd been doing it all her life. That was the interesting thing about this place. I once asked them how long the farm had been in their family and they all looked a little perplexed and just said "always". The whole family lived in what we have called the 'Igledy Piggledy House' as it is on lots of level and randomly arranged. The whole family consisted of six children plus mum and dad. There was only one bedroom and no running water or electricity. Their water came from the 'ariana' which no-one could translate but they all agreed must be a dialect word for the spring or underground river on the land. The water would be carried up in big pots to the house as it is a good 300m away, down several terraces and some precarious loooking tiny stone stairs. They lived like this until the late 60's when the last of them left. We found an old school book of Rosella's (one of the sisters), sadly almost ruined from the rain, but you could still make out the date of 1960-something. When I was born in 1968 we lived on the 16th floor in a huge concrete tower block in Custom House in east London. The contrast could hardly be greater. On Wednesday, when the rain finally paused, we decided it was time for me to at last walk the borders of our farm so I could see what we had actually bought. We started at the Iggledy Piggledy House and walked as far as we could, to the east. We could go no further due to a fallen tree and the fact that the land descends very steeply into woods and brambles. Part of it is ours though. Then we went down the terraces, tracing the edges of the land. Down and down we went until we reached the last terrace. This part of the land has the most enormous trees. It's not always possible to tell from the size of the trunk as over the years they may, for all sorts of reasons, get cut right down to ground level and in our case many small trunks then emerge. Where some of the dry-stone walls have collapsed you can see the size of the original trunk/root ball (for want of a better word). They are over 2 metres across! Absolutely huge. I have been trying to age them by looking online and I reckon they are anywhere between 400 and 700 years old whilst the ones on the western side of the farm are relatively young at around 100-150 years old. We then followed what used to be the old road, according to the Romagnone family, along to the 'Long House' which will become our home eventually, when all the other work is done and we are hopefully earning a living from the agriturismo we plan to have. We stopped off at the ariana which is overflowing due to all the recent rain and then followed the driveway (well, it will be when we've sorted it out a bit and get our 4x4) to some stone stairs which lead to the top terraces. 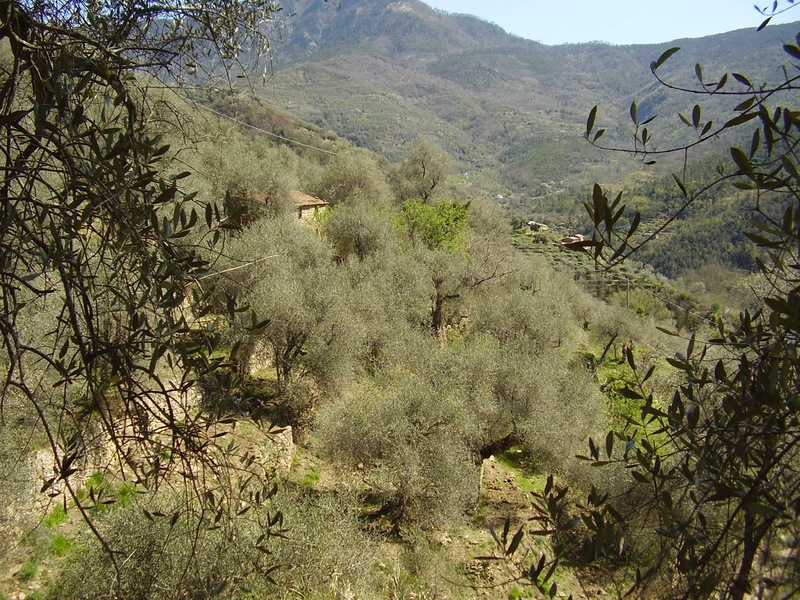 On the first top terrace, which is the crest of a hill, there are only a couple of olives and it is full of fragrant Mediterranean 'macchia' or scrub. It was very dry up there which is always a bit of a worry for the frest fire risk but I suspect it is always dry up there. We followed the terraces around the hill and up through the little rock pools which were full of water (I doubt they will be in summer) and up to the last terrace. It was beautiful up there. Very open and somehow cooler. We did the easy walk along this that leads us back past where the swimming pool will hopefully go and one of the ruined outbuildings to the Iggledy Piggledy house. Paul said "now you've seen everything I've seen" and it was true. There is much more land than I had appreciated and now I can see how come they said we have 200 trees. One of our next jobs will be to number them all so we can count them and allow them to be named properly. We have a huge problem with wild boar (cinghiale in Italian) in this area. There are hundreds, maybe thousands, of the big wild pigs and they use their snouts to root for food. Problem is in doing so they wreck the dry-stone walls that retain the manmade terracing that is such a feature of this area. Also, we can't really have them rampaging through our land when we have guests. How would you feel to be confronted by a 250kg boar with tusks when you step out of your holiday cottage? I know I would be stepping back in again, sharpish. How can we stop them? This is a good question. Obviously in season you can shoot them and they do taste rather delicious in stew or sausages but that is not really a proper answer although I am sure Paul will give it a go. I have looked online at all sorts of contraptions from lion dung (yes - some American website was selling this but, as I have no idea what it looks like nor what it smells like, how would I know if I'm being fobbed off with just big doggie doo doos?) to metal cut outs with big shiny eyes to scare them off. As boars are have fairly poor eyesight I wasn't convinced by the latter solution either. The only way to keep them out is with a fence. Either a big, rufty tufty proper fence or a less obvious electric one. This brings me neatly on to walls. We have many kilometres of dry-stone walls on our farm, a good proportion of which need repairs or have collapsed altogether due to the bloomin' cinghiale so when the Ligurian region offered a grant for you to repair your own walls as an encouragement to farmers to keep them maintained, to stop the kind of disastrous landslides that affected the Cinque Terra area, we snapped their hand off. Paul is from North Yorkshire and not unaccustomed to a dry-stone wall or two having worked with his father (who was a builder) renovating stone barns etc. and was more than happy to do the work. So for the last few months this is what he has been doing. He absolutely loves doing it. I practically have to tear him away from the blessed things. He is doing a rather fine job of it though and it will look so beautiful when they are finished. What we didn't count on, however, was Ruby's first year at nursery meaning we would be struck down with every cold, virus and flu bug known to man! Friends warned us but how bad could it be? Well, it was bloody awful and Paul missed weeks and weeks of work. Then there was the rain. We seem to have had one of the wettest winters on record and the one thing you can't do in the rain is dry-stone walling. It does wash the walls of nicely and make the soil lovely and soft for digging but proper walling is a no-no. Our deadline of 31st March is looming and we have taken the decision to ask for an extension due to the weather. It is rather a blow to moral but does take the pressure off Paul and means we can prune some trees before it gets too late in the season. In the meantime, the Province of Imperia has issued a grant where they will pay 90% of the cost of an electric fence to keep the boar out. Hoorah!! It is a mightily expensive thing to put up when you have 4 acres of hilly terrain to do, so all help is gratefully received. Well what we knew about olives could have gone on a micro-dot - a postage stamp would be too big! We like to eat them, we like to use the oil but we weren't honestly too keen on the local variety Taggiasca. The oil had no taste and was just flimsy. We thought we would have a bash at at least getting some oil out of our trees this first year so we knew a little more and had a bench mark to compare other years to. We bought a strimmer. This was pretty vital as without using it you couldn't see the huge boulders and ankle-breaking stones on our broken down terraces. We bought a few nets and a friend lent us some old ones. We bought some sacks and some crates and some oil containers. There were already big sticks on the farm so off we went. First discovery is that olives are actually fairly firmly attached to the trees. Second discovery is that whacking the tree with a stick requires a lot more technique that it would first seem. The obvious fact was also that he trees had not been trimmed in twenty or more years and so we just couldn't reach the tops of them to get to the olives. Oh well, this was our first year so we weren't aiming for perfection, just the experience of it and the taste of our own oil. After nearly a week (it rained during our mini harvest) we finally had as much as we were going to be able to gather without the remainder spoiling so we were ready for the mill. We had done the sum total of nine treees out of two hundred. Don't laugh! 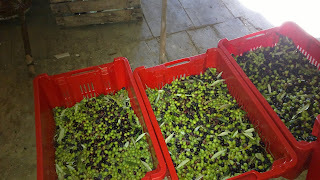 The mill owner certainly didn't when we turned up with our titchy quintale (100kg) of olives. She almost said she couldn't press them as there wasn't enough. She eventually did it and we had to pay a little extra. It was worth it. 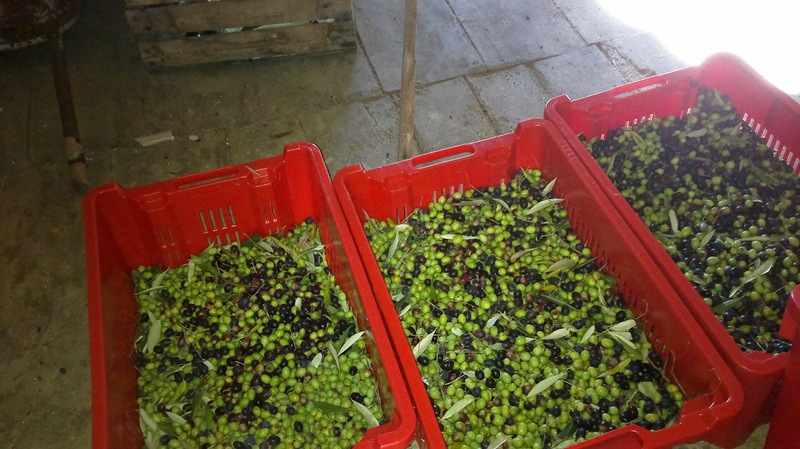 When we picked up our containers with eighteen litres of our own bright green olive oil we were ecstatic. Now for the taste test. All I can say is we must have been buying engine oil or lamp oil labelled as Taggiasca. The first taste of our oil was a shock. It was peppery and spicy an hit the back of the throat. What on earth was that greasy insipid stuff we had tasted before? You didn't so much drink our oil as eat it. It is so flavoursome and hearty. We were hooked! It was stunningly delicious and seemed to go with everything. We now know that is the secret of the Taggiasca oil. It suits every type of dish. 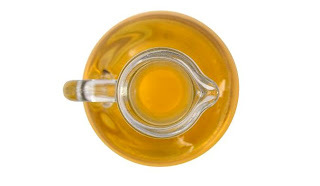 I now also know that good olive oil should hit you in the throat, especially when it is first pressed. It mellows with age a bit and changes colour from a scary bright, almost luminous green to a straw yellow now four months on. I am now a convert. I would even go so far as to call myself an evangelical convert. I find myself reading everything I can get my hands on about olives, oil and milling. We have attended tree-cutting courses and next year I plan to do an olive oil tasting course to become a qualified taster. If this blog does one thing I hope it will spread the message that the majority of what you buy in supermarkets is that same insipid greasy muck I first tasted. Sometimes it is even coloured to make it look more authentic. If you want good oil, buy it from the producer. There are pelnty of us out there. If you want to know more about good oil and the misleading labelling in the olive oil industry I strongly recommend this book: Extra Virginity - The sublime and scandolous world of olive oil. Deciding to buy it was the easy bit. We just had to sell our house in Le Marche and even if we couldn't, we could finance the purchase via a mortgage or so we thought. Well, that proved to be not so easy in a worldwide recession and there followed a very stressful 18 months of trying to raise the funds. I blame pregnancy hormones giving me false hope - not sure what Paul's excuse was! So we set off begging, borowing and scraping money together. Our house still hadn't sold. In the meantime there were three funerals in what was a pretty small family anyway. It rather felt like things were never going to get better. Eventually with much blood sweat and tears we managed to do it. We had agreed a long completion but no-one, least of all us, had expected it to be quite as long as it was. That meant we had taken 28 months from first viewing to finally buying the place. I asked my estate agent friend if it was a record. She admitted to only knowing of one that had taken longer. Without her perseverance and dilligent attention to detail we would never have got there at all. Without the help of family and friends we would have lost our deposit which would have been everything Paul had ever worked for so pretty devastating. We are blessed to have such good friends and family. We only finally signed the deed on 23rd May 2012 - not even a year ago. Not before two of the ten owners had sadly died (one in Spain to complicate matters further) and we had to wait for the legal inheritance to go through. Don't they say nothing worth having is ever easy? 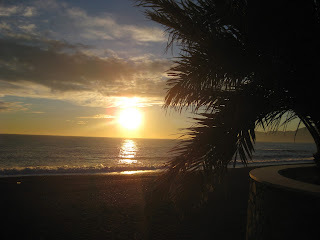 We moved to Bordighera in April 2012, still with our house in Le Marche on the market, to a rented flat at the beach. That was a great big sigh of relief from us both. We finally felt like we were moving on. OK we hadn't sold the house so money was very tight and we couldn't actually do much on the farm without the money from the house but we were here at last. I was pregnant and we thought hard about where we wanted to bring our daughter up and what we wanted for her future. We'd been in Le Marche in central Italy for 6 years and whilst it was very beautiful it was also very, very quiet. Great if you're retiring or trying to escape from the rat-race but we could hardly claim either of those. We had visited Liguria for the day during a trip to Lucca the year previously. I fell in love instantly. Paul had been driving for hours and was tired and grumpy and didn't. Whenever I mentioned it afterwards he growled about it. His dream was always that picture-perfect Tuscan countryside and nothing else would really push his buttons. 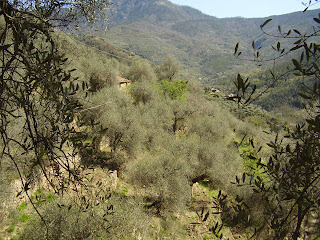 Something had happened to me when I had strolled under the ancient olive trees in Liguria on that trip. I can't really explain to other than to say I felt a peace I have never felt elsewhere. We did our usual trawl of the internet in search of pastures new and saw an old olive farm with several buildings and Paul was instantly captivated. "That's it - let's go!" he said in that crazy impulsive way he has. I was 3 months pregnant and on strict instructions to do nothing from the doctor so he would have to go on his own as it is a 750km journey. We made the arrangements and off he went to look at this and one other property. This really was nothing like either of us. We had looked at over 80 houses before buying in Le Marche so impulsive house buyers we were not! He called me all the time. I could hardly stay awake as I was still at that falling asleep stage of pregnancy. He described it all in great detail - we were so excited. He loved it. He came back and we made plans to go and see it again when I was further along in the pregnancy. It would be a great place to bring up our daughter. Quiet inland with a bustling coastline, near to Nice, Monte Carlo and the big Italian cities sof Milan and Turn plus no distance from Sanremo which has everything you need for everyday life. We had a little holiday in Liguria in the April and our daughter Ruby was born in August. Just before she arrived we decided to buy it. We loved it. Everything about it was perfect. 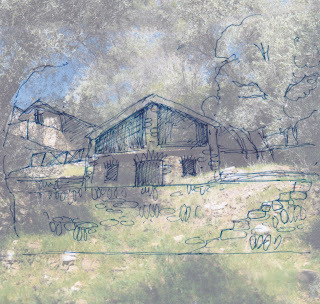 There were two larger properties that could become houses (one to let and one to live in) and three outbuildings that could become more accommodation - perfect for our plans for an agriturismo (or farm-holiday business). It had water and electricity nearby plus telephone. The road was not too steep nor too windy and there were plans to concrete the final part practically to our house so access wouldn't be a problem. Most exciting for both of us was the plot itself. It had beauitful views of the hilltop town of Perinaldo and the other olive groves and was all south-facing and gorgeously sunny. As we now know it is always Spring up there, even in mid-winter! Our new adventure had begun. We didn't expect it to take quite as long to get here as it did but then this is Italy and nothing ever happens when you expect it to here.